Wear a navy suit and a navy dress shirt for a sharp, fashionable look. For something more on the daring side to complete this look, choose a pair of black leather derby shoes. Contrary to what you might believe, getuping sharp doesn't take that much time. Just opt for a black blazer and blue jeans and you'll look incredibly stylish. You could perhaps get a little creative when it comes to footwear and spruce up your ensemble with black leather derby shoes. 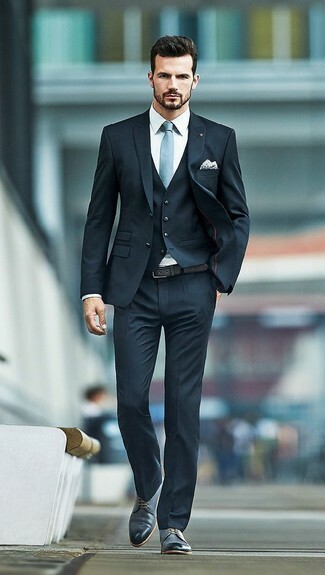 Pair a black three piece suit with a white dress shirt for a sharp classy look. Marsèll classic derby shoes will add more playfulness to your outfit. If you're all about comfort dressing when it comes to fashion, you'll love this on-trend pairing of an aquamarine print crew-neck t-shirt and black denim overalls. Rocking a pair of Marsèll classic derby shoes is a simple way to add some flair to your getup. For a nothing less than incredibly stylish getup, pair a navy suit with a red crew-neck sweater. 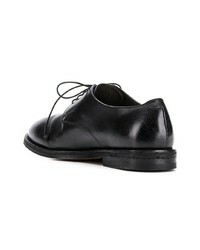 Marsèll classic derby shoes from farfetch.com will add a new dimension to an otherwise classic look. 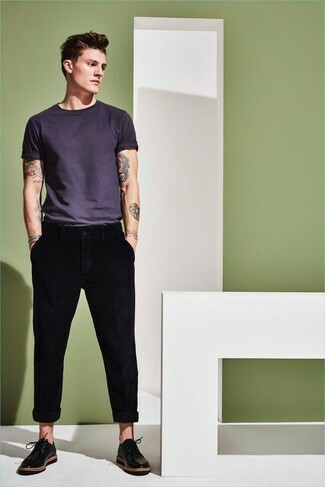 If you use a more casual approach to dressing up, why not consider teaming a charcoal crew-neck t-shirt with black chinos? 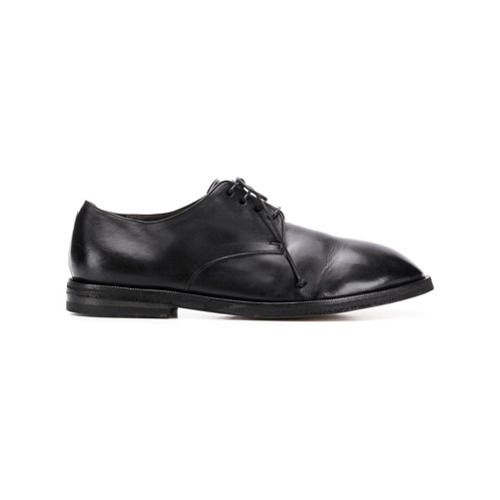 Kick up the cool of your outfit by finishing off with black leather derby shoes. As you can see here, being a dapper dude doesn't take that much time. 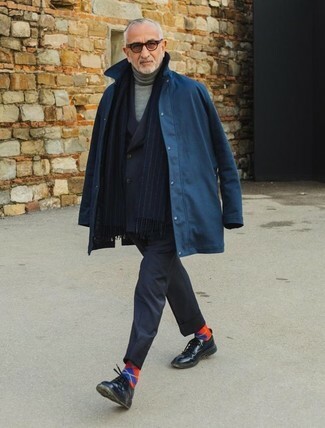 Just consider pairing a navy raincoat with a black double breasted blazer and you'll look awesome. Finish off with Marsèll classic derby shoes and off you go looking amazing. Contrary to what you might believe, getuping sharp doesn't take that much time. Just go for a navy blazer and olive chinos and you'll look savvy. 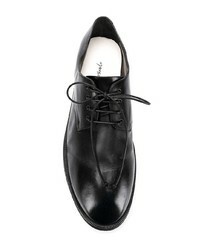 Up the cool of your outfit by finishing off with Marsèll classic derby shoes from farfetch.com. 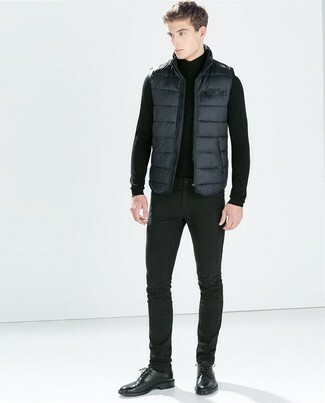 If you're scouting for a casual yet stylish look, pair a charcoal gilet with black jeans. Both pieces are totally comfortable and will look great together. 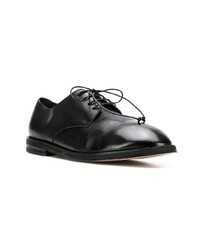 Rocking a pair of Marsèll classic derby shoes from farfetch.com is a simple way to add extra flair to your getup.